In the design of safety devices, technology considerations have great signifi- cance. Depending on the complexity of Safety frames, their composition can require undesired extra implementation efforts. Support of multicast messaging helps achieve fast response times. These in turn can be influential for the overall plant or machine design, for instance reducing machine footprints and required floor space. After maintenance or device replacement, safety slaves should automatically be configured by the safety master. Configuration interfaces need to be spe- cified and unique so that devices can be configured by different masters. For PROFIsafe, the iPar-Server has been developed to cover this requirement. Its interoperability status in the market is unclear, because in the past, configu- ration data came from the manufacturer of the master used rather than from within the system. In April 2012, the sercos International (SI) user organization announced the development of a Safe Motion Profile for CIP Safety on SERCOS III. By the time of publication of this brochure, however, a Safe Motion Profile based on CIP Safety does not seem to be available. 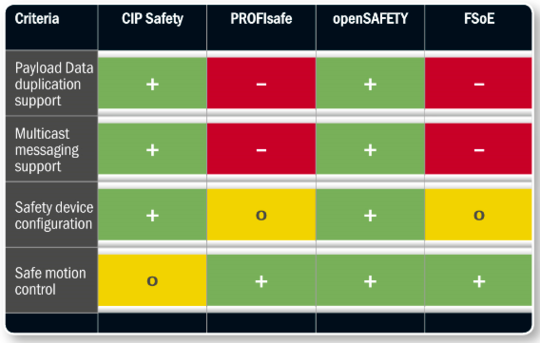 FsOE offers a safe parameterization channel to transfer safe encapsulated data to the safe application, but addressing scheme of the safe application parameters does not exist.